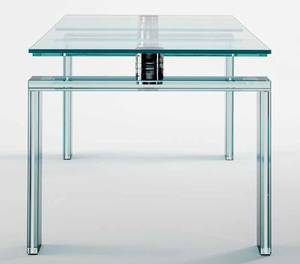 Description Similar to Bluenote, but with a slightly different leg design.15mm thick glass top and extensions (transparent or extra clear). The unique extension mechanism is made from aluminium and steel with a shiny, polished finish, and enables the extension leaves to be rotated and lifted into place. The legs are made from sheets of glass bonded together available in 2 different finishes (see images below). Can also be made in custom sizes, please call or email us for a specific quote.